Happy New Year! My husband, son, and I just returned from a Central American trip arranged by Capricorn Leisure and I wanted to report on it. We went through the brochures to plan our trip, but didn’t find exactly what we wanted, so we worked with Jeanne at Capricorn, who arranged something especially for us. We started with two nights at the beautiful Lamanai Outpost Lodge in northern Belize which is reached via a 30-45-minute drive from the airport, followed by an hour-long boat trip up the river. We were really made to feel welcome — we arrived, dumped our backpacks in our room, had a two-minute “orientation,” and sat down to margaritas, all without any administrative fuss. The Mayan site of “Lama’an Ain” is a very short walk or boat ride away, and the guide who took us around was both knowledgable and passionate about the site and its previous occupants. The food was very good, and they gave us access to boats/kayaks, golf umbrellas, and even the Internet! After our two nights, we boarded a seven-seater for a very short flight back to the Belize City airport, where we were picked up by a driver for Windy Hill in western Belize. We were scheduled to take a tour of the Belize City Zoo on the way to the hotel, but unfortunately ended up waiting for a couple who changed their plans and decided not to come without informing the hotel. (May they be bitten by all the mosquitoes in Belize!) After waiting three hours for them, we proceeded to the Cayo District. The Windy Hill hotel is made up of many individual bungalows; meals and drinks are served in two other buildings. The food was okay, although way too salty for our taste. Meals are served based on a fixed menu, so let them know if you have any special needs. The thing we liked best about Windy Hill was the tours they arranged (and after all, that’s why we were there). The first full day we departed at 8am for a three-hour drive on the worst roads we’ve ever been on, to the site of Caracol. This was the most magical day imaginable: there had been rain the day before, and the road was muddy, slippery, and in someplaces all but impassible, all of which meant there were only eight tourists and two guides in the entire site! We hiked for several hours, and I can’t describe how awed we felt, surrounded by ruins and jungles. Before driving back, we sat at picnic tables and ate a bag lunch provided by the hotel. The next day we started even earlier, because we were going to cross the Guatemalan border for our trip to Tikal. Looking back, we might have chosen to stay at least one night at Tikal, so as not to have all that driving every day, but we survived. Tikal is one of the better known Mayan sites, and the driver/guide provided by Windy Hill was very good. Again, the tour was fairly strenuous, with lots of stairs. Lunch was at a local restarant, and we all enjoyed various forms of chicken and fries made from yellow potatoes. The final day back in Belize started with a visit to Xunantunich, which probably should have gone second, so as to build up to Tikal. Again, the guide was really terrific, and took the time to tell us lots of Mayan herbal remedies since we had already been told a lot of other facts about Mayan sites. Later he drove us to Guanacaste Park, a tour of the capital city of Belmopan, and finally to the wonderful Belize Zoo, before dropping us at the airport for our flight to Honduras. We arrived at San Pedro Sula airport at 8:30pm on New Year’s Eve, and were picked up by Wilfredo. This was really the first time we had encountered someone who didn’t speak any English at all. We communicated that we needed to eat dinner, and he took us to a local hotel, since nothing else was open that night. After a cafÃ© dinner, Wilfredo drove us through firecracker and bonfire-filled streets to Copan Ruinas, about two-and-a-half-hours away. We arrived just in time to pull California champagne out of our luggage and toast 2003. We stayed at the Marina Copan, which was very luxurious. The food here was terrific, too, though it was also expensive. We went another day to a local restaurant, and had a great meal for about US$15, including beer. 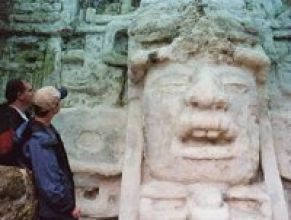 On January 1, we spent the morning touring Copan with Walter, a very nice guide, although somewhat lethargic. The best part of the ruins, in my opinion, was the museum, which has the real artifacts; the ones in the ruins are all copies. After spending a couple of hours resting and eating lunch, we spent two hours riding on horseback up to a very small site named Los Sapos, and back. The horses were complete slugs; we could have walked faster! But it was a nice way to go up there, and if you’ve never been on one you would probably enjoy it. The site is nothing to write home about, although the view of Copan across the river is terrific. The next morning, we spent a couple of hours at another nearby minor site, Sepulturas. We wandered around looking at the scribe’s home, and local flora and fauna, without a lot of input from Walter. We had the afternoon to ourselves, which was rather a relief by this time! Unfortunately for us, the rain started that night and didn’t stop until Monday morning, when we were scheduled to go home. We found out that the airport had been closed the entire time we were in Roatan, and that no one had been able to leave, so you can imagine the uproar at the airport on Monday morning! Still, Jeanne from Cabricorn Leisure (800/426-6544) had planned well, and we made our connecting flight to Miami at 2pm.